Core Competencies | MacKellar Associates, Inc.
MacKellar's principal portfolio consists of outstanding manufacturers, providing great synergetic opportunities for our customer base. The electroform process produces a highly detailed, jewel-like appearance capable of achieving a wide range of complex shapes, curves, finishes, patterns and textures. MacKellar has been a representative of world leaders in such high quality nameplates specializing in interior jewels, medallions, badges, logos and emblems. MacKellar’s electroplating product portfolio includes door handles, knobs, grill and hood shields, mirror scallops and covers, name plates - and other interior/exterior chrome applications in various finishes. 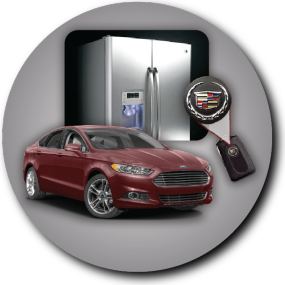 As an industry leader in aluminum wheel covers, sill plates, and interior emblems, MacKellar’s principal portfolio has expanded to include engine badges, sill plates, and steering wheel badging. MacKellar’s “Painters” are Class A with a combined dedication to interior and exterior automotive parts, as well as domestic appliances and consumer electronics. Painting processes include high-gloss and mid-gloss on plastic or metal parts. Industrial screen, flexo, digital printing, and especially In-Mold Electronics capabilities, coupled with flexibility, quality and customer service are the cornerstones of MacKellar. In-mold decoration (IMD) is the preferred way to decorate plastic products. MacKellar's decorating specialists can facilitate production more efficiently by eliminating the need to change the resin in a molding machine to accommodate a new color. Commitment to producing the highest quality injection molded products has been MacKellar’s experience from initial design concepts to delivery of cost-effective solutions.